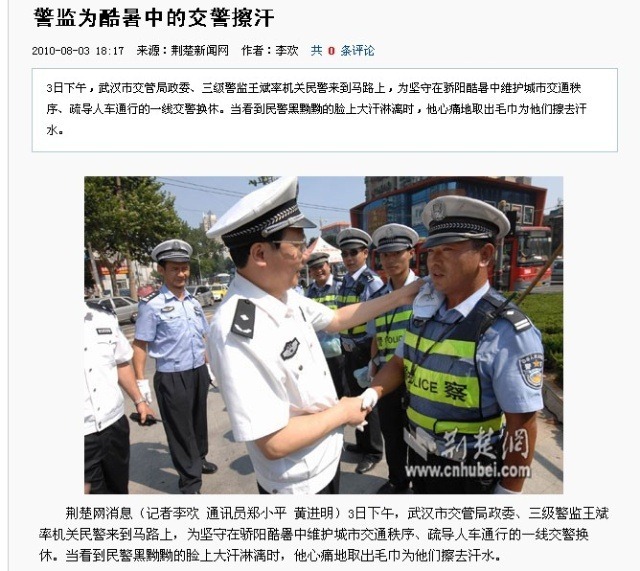 August 10, 2010, a well-known Chinese blogger Zhang Hongfeng wrote a blog post titled “Wiping Sweat Gate: traffic police lined up under the hot sun for half an hour waiting for political commissar to wipe their sweat”, the article spread on the internet like a wild fire right after it was posted, in less than one day there were over 1,600 posts about “wiping sweat gate” on Sina micro-blog alone, and with over 500 comments. Most people on the internet think it was just a performance the leader has put up. News background: Chutian Metropolis Daily and Yangtze daily all published this news with photos on August 4. 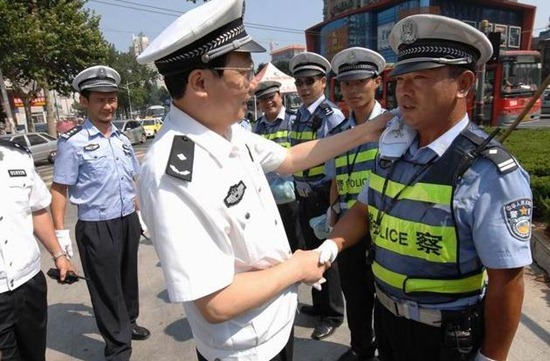 The hot sun directly shined on the bituminous roads; surface temperature was close to 50 degrees C. Thousands of traffic police, patrol police and civil police, wearing police uniforms, police hats and belts, covered with reflective vests stood under the sun in order to ensure the smooth flow of the Wuhan street traffic. 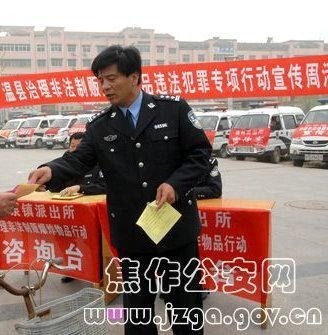 Wuhan Public Security Bureau Traffic Authority Political Commissar Wang Bin let the civil police to the streets to switch shifts with traffic police on the frontline. 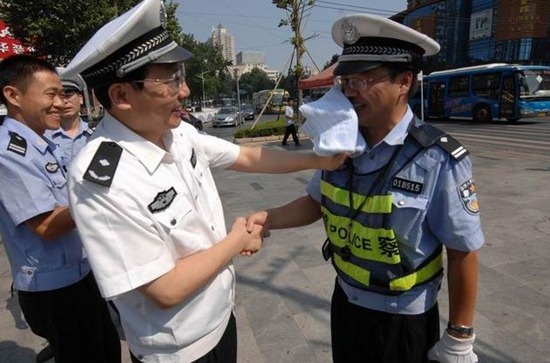 When seeing the dark sweating faces of these traffic police, Wang Bin’s heart was aching, so he wiped sweat for the traffic police. 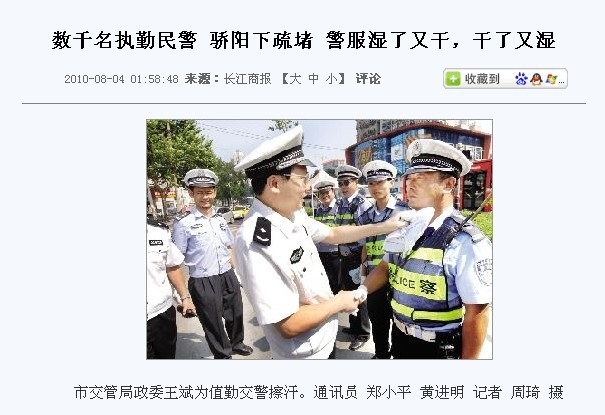 Zhang Hongfeng’s comments: The policeman who exposed the news asked me to look at the picture on “Yangtze Daily”, said that picture clearly showed the police were lined up and waiting for the political commissar to wipe their sweat. “Wiping Sweat Gate” was the name the policemen came up with to talk among themselves as a joke in order to vent their dissatisfactions. 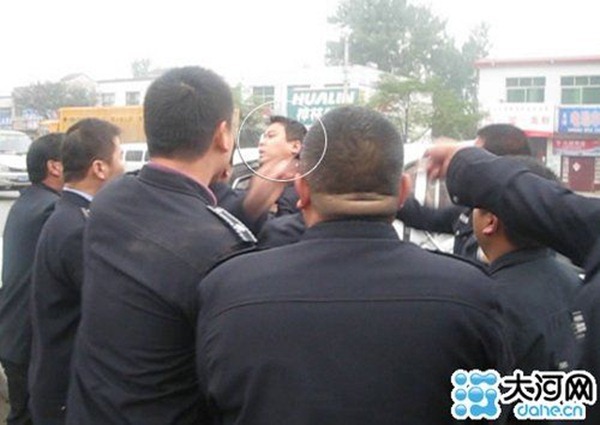 I looked at the picture carefully, this policeman indeed “has the picture that tell the truth”. When the political commissar was wiping sweats, should he think about the feelings of the frontline police officers? If he really cared about his police subordinates, how can he let them line up and wait for him in the heat? If he really take good care of his police subordinates, why not randomly go on the street to send them water and wipe their sweat? Sometimes a “show” becomes a fraud, this fraud really hurts the police at the front line, and it only benefits the “glorious media image” of the political commissar. Front line police became the “props” of the political commissar’s self-publicity, and became the background of his “glorious image”. I want to ask Mr. Wang Bin, do you really feel you have a glorious image? You really feel you care about the policemen at the frontline? Do you really think the main character of this media story should be you? 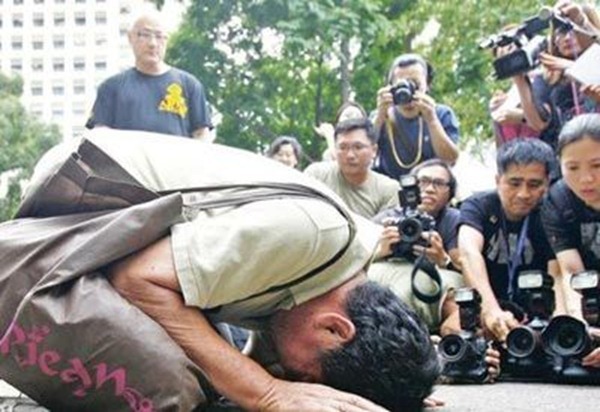 Should you apologize to the policemen who lined up under the scourging sun to wait for you to put up a show? Should you apologize to all public readers? Update: “Wiping Sweat Gate” incident caused more media attentions, I will update this post in response to the reports. 1. 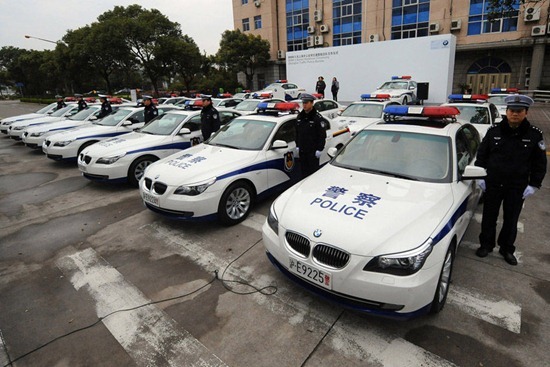 When Wuhan police was interviewed, they said the police did not wait for half an hour, they got together in one minute through calling station. Whether if they waited half an hour or not, I am not able to verify, but I contacted the police who exposed this, he said because of the high temperatures recently, there is only one traffic police on duty in each district. According to the current situation of traffic police on duties, you don’t see group of traffic police on duty together. So Let me ask, how did these policemen all show up at one place in one minute? They can fly? Moreover, the question was why Mr. political commissar made his police subordinates all line up so he can wipe their sweat. 2. 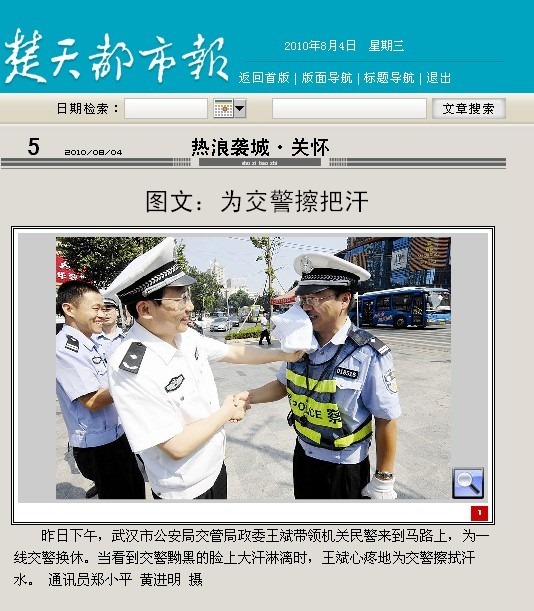 On the newspaper, it said photo by Zheng Xiaoping (郑小平) and Huang Jinming (黄进明), after researching, according to Chutian Metropolis Daily on 11/21/2007, Zheng Xiaopping is “the deputy section chief of the Wuhan Public Security Bureau Traffic Authority publicity department” and according to Hubei Daily on 3/19/2009, Huang Jinming is also one of the other “the deputy section chief of the Wuhan Public Security Bureau Traffic Authority publicity department”. 2 deputy section chiefs responsible for propaganda, bunch of media and also 2 other officers wearing white uniforms (senior officers), number of policemen lined up under the hot sun, how was this kind of grand event possibly not being pre-arranged? How can they be randomly “called” over through the radio? Please don’t treat the public like fools. 3. 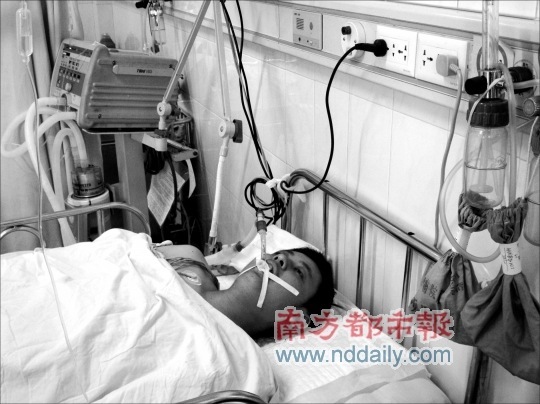 Wuhan police told the media, that the person who told the story probably is not a police officer, possibly was one of the bystanders. I write blogs, has always been very strict and careful about my information. The policeman who told me the story did not just meet me for the first time for this, we have had prior communication and exchanges, so I can confirm that he is a traffic police officer, but not some bystanders. Furthermore! the fact of with so many onlookers nearby, the political commissar can still smoothly wipe sweat for the lined-up policemen, really makes me feel so ashamed. Ahh, nothing inspires more to have a boss visit. hahahA! not surprised, if u’ve ever been part of the Canadian or British military… you’d know just how fucked up any of such dictatorial system could get. A line of uniformed men stand in the hot sun. Sweat drips from their brows and chins. A large sedan slowly glides to the curb in front of the uniformed men. The driver gets out and opens the sedans rear door and kowtows. Big Daddy Leader, cool and collected gets out and walks up to the line of men who snap to attention. Oh what a fine display. Big Daddy Leader snaps his hand and an assistant hands him a fresh white towel. Big Daddy Leader elegantly holds the towel and begins to delicately blot the brow and neck of the closest uniformed man. Only Big Daddy cares about his little boys. Look how Big Daddy wipes the manly humble sweat from patriotic workers brow. Thank you Big Daddy Leader. Only give the word and your patriotic worker would kowtow and humbly return the favor when Big Daddy Leader goes to the toilet. Big Daddy Leader smiles and moves to the next uniformed man. This “sweat wiping” show was so badly set up – did the leaders really think that everyone around is stupid? Sweat wiping… disgusting. Just let them go home for the day. I’m sure the traffic in China cannot improve regardless if they were there or not. Not to mention those on duty have just spent half an hour gathered at one point dawdling.